On Friday 9 December the first Community Safety & Wellbeing Event was held in Northumberland Park, organised by Haringey Council and The Bridge Renewal Trust, with representation from Homes for Haringey and various volunteer and support agencies from across Haringey. The day focused on safety and wellbeing, which included the benefits that volunteering can bring for both individuals and the community as a whole. 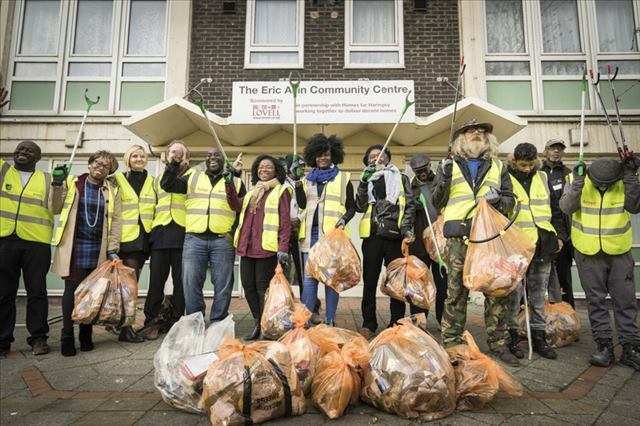 This included a community litter pick, led by the newly-formed group of safety champions with help from CleanupUK and Veolia, before the event opened and information about the variety of volunteering opportunities available. The day also highlighted the importance of keeping active, including a fun five minute workout with Streetz Ahead which got everyone, including the Mayor, on their feet and fired up for the day ahead. Residents also got to meet the lead mentor for Community Shop, who will be operating north London’s first social supermarket when it opens in the Eric Allin Centre next year.